Ordinary people sometimes find themselves in dire circumstances affecting an entire community. As Rebecca Solnit points out in her wonderful new book, A Paradise Built in Hell: The Extraordinary Communities That Arise in Disaster, such crises can provide openings for real political and social change. I was held spellbound by Solnit’s thoughtful exploration of five major disasters, ranging from the San Francisco earthquake of 1906 to the flooding of New Orleans. She delves into human responses to catastrophe and finds a common thread among them: “an emotion graver than happiness, but deeply positive” often arises when people are confronted with an intensely challenging set of circumstances. This inner response can be life-changing, as in the case of young Dorothy Day. 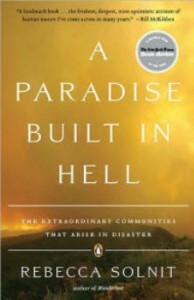 An earthquake survivor who noticed that “while the crisis lasted, people loved each other,” Day ended up devoting much of her life to tirelessly promoting the loving community she knew was possible – because she had experienced it firsthand when people’s most remarkable caring qualities manifested during the disaster’s immediate aftermath. This book is so rich that it’s tricky to tease out just a few aspects to comment on in a brief review. One compelling thing Solnit reveals is also an aspect of the Work That Reconnects that excites me: the recognition that through our human response to severe crises, we can, and do, enable transformation that might be seen as catapulting us forward into our “highest and best” selves. I find myself wondering whether the biggest disaster of all – climate disruption – may elicit the kind of evolutionary leap (on the magnitude of a pole vault) necessary for the whole of humanity to experience the shift in consciousness needed for Earth healing. 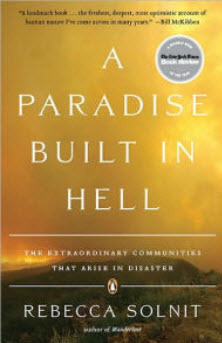 In this precarious time of apocalyptic popular culture such as the movie “2012,” I’d like to share a look at the seemingly implausible reality of A Paradise Built in Hell, in which Solnit unmasks the “law of the jungle” for the imposter it represents. People who initially step forward to provide help after a community-wide disaster occurs are not primarily the trained first responders, because there are simply not enough of them. Rather, it is the ordinary person who – temporarily liberated from her or his mundane life – is thrust into a new and vital role. Yes, this person makes a choice to act. It is a choice born of unique circumstances as the situation calls forth hidden reserves of strength and confidence, and fosters cooperation. I’m fascinated by the examples Solnit presents of ordinary people not simply showing compassion because the aftermath of disaster brings out people’s altruistic tendencies, but coming together in a particular type of anarchy, “where the citizenry by and large organize and care for themselves.” Solnit investigates the kind of mutual aid that is evidence of self-organizing systems, and the profound effects on people’s lives when they pitch in to become a part of something bigger than their nuclear family. Yet in focusing on these effects among “civil society” in a city or other community, she doesn’t neglect the larger analysis. As it turns out, many disasters open the way for change because during the time of immediate and vast needs the government “fails as if it were overthrown” while civil society succeeds as though a revolution has occurred. As we are reminded during Interhelp processes, our intentions are what make all the difference. A mix of people with diverse backgrounds can achieve loving success when a clear way is perceived. For instance, because they cared about feeding hurricane victims and knew their primitive-living skills would be valuable, some Rainbow Gathering/Rainbow Family participants quickly made their way to the Gulf coast to work joyfully side by side with members of an evangelical Christian church group. They shared makeshift kitchen space, served as many as four thousand meals daily, and listened to survivors’ stories while setting up a “wall-less mart” making basic supplies available to those who needed them. These hard-working helpers rose up together, organically, in the face of a situation where others (misled by public officials and the media to fear violence) closed their hearts and turned away. “Beliefs matter,” Solnit reminds us. They matter a lot. A question that is posed by this book is, “Which is more important – preserving property, or extending a hand to people?” The panic that occurs after a disaster is most often on the part of those who have much invested in the status quo, who fear the results of a broken-down system. In fact, looting and violence were quite rare in the emergencies that Solnit investigated. Most violence was the result of repressive measures put in place by authorities who perceived that if they were not in control, then the whole situation was out of control. Sadly, these repressive measures then became secondary disasters. When I reached the end of this book, I found myself wishing for a second volume, covering yet another array of crises: the South Pacific tsunami, the China earthquake, the New England ice storm, the San Diego-area fires. I feel an insatiable desire to learn more about how ordinary people can rise up to be their best selves. Our best selves. Will we find our affinity with survivalists who hole up pioneer-style defending themselves by force, or with a more gregarious, generous, and open-hearted band of people from all walks of life? Copyright 2015-17 Interhelp, Inc. All Rights Reserved. Special thanks to Interhelp artist-photographer Diane Szymaszek.